At Stratton Court Barn we work with a selection of approved caterers. Their different style of food and price ranges offers you ultimate flexibility when choosing the caterer for your event. Sample menus consisting of two starters, two mains and two desserts can be downloaded below along with prices. These caterers also provide brilliant evening food options. Prices include VAT, crockery, cutlery, linen, kitchen equipment and wait staff. Bespoke quotes can be obtained directly from the caterer. Wonderful, heart-warming, home-cooked food is Sally & Jasmine's speciality. Food is served family-style with great cheer. Price: From £32 per person. Lemon Zest is a multi-award winning family business founded in 2002. Run by Natasha Steiner and her dedicated team, all of whom are passionate about food. 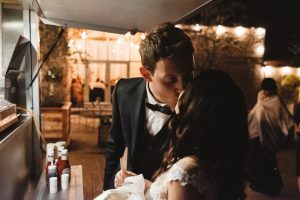 They have been creating amazing dishes for couples at Stratton Court Barn since 2014. Working closely with your ideas they strive to create the perfect menu to complement your big day. Price: From £48 per person for a minimum of 60 guests. Includes 3 complimentary canapés per person for the drinks reception, along with tea, coffee and truffles after the meal. Passion for freshly prepared, locally sourced food. Seasonal where possible, cooked well and served beautifully. Supporting British agriculture in Oxfordshire and the surrounding Cotswolds. We have a simple, uncomplicated approach to wedding cater ing. Whether it be a relaxed Sharing-Board Supper, a Five Course Feast, or our brilliant Festival-Style BBQ, everything centres around three things: seasonal produce, quality ingredients and making your day personal, memorable and unique! At Hart's, quality and attention to detail is what drives us. The Wild Oven offers an array of fabulous wood fired food, served in the most unique style... We have built wood fired ovens within each of our classic vehicles and it is here that we cook all our food, adding intrigue and theatre to your occasion. The Wild Oven brings professional style with a twist. Price: from £61.50 per person for 3 courses including tea/coffee and truffles. A family run business from the fabulous Cotswolds. We pride ourselves on our professional, yet friendly approach to serving the many guests at our varied events. Wherever possible we try to use local, free range ingredients in all our cooking which pays dividends, as our customers can tell the difference and appreciate our attention to detail. Price: from £23.50 per person which includes beautiful vintage crockery. While the above caterers provide fantastic evening food options, you're welcome to have an evening food van instead! From traditional English fish & chips to Greek souvlaki, we've got some amazing vans on tap. Have a look at our Supplier page to see a few! 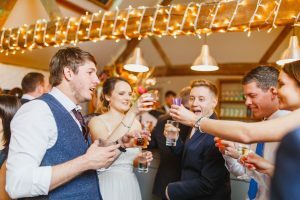 Stratton Court Barn provides the drinks for your day. A stocked and staffed cash bar is open from an hour before the ceremony until 11.30pm. We also have an outside bar, the perfect place to enjoy a cold drink in our sunny courtyard. 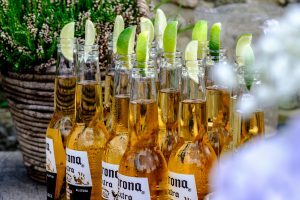 Guests can buy their own drinks, or you can of course put money behind the bar for guests to enjoy. In addition, we have drinks packages and a wine list to choose from. Alternatively, you are welcome to provide your own wine at a corkage charge of £10 per bottle of wine and £15 per bottle of sparkling wine. Please get in touch with our team on 01869 278899 or 07807 645048 to discuss your requirements in further detail.